Given the right care, your telescopic bleachers will last generations, but it takes effort, care and knowledge on your part. Just like your car needs an oil change, your telescopic bleacher needs preventative maintenance to ensure proper operation. Hardware: Loose and missing hardware. This one is pretty basic, you want to make sure the hardware throughout your unit isn’t damaged, rusted, missing, or loose. This goes for the understructure, aisle rails, guardrails, seat components and so on. Your hardware should be looked at on a regular basis during normal operating procedures. If you see something wrong you should fix it or have it fixed to prevent additional damage to the components that it is holding together. Missing or Damaged Row Locks: Row locks are an important component of all telescopic bleachers. They are needed to prevent one row from closing before it is intended to be closed to stay in the proper sequence. There are many people out there that work on bleachers that say it is ok to just take the row locks off if they get damaged if the bleacher is powered. This is not the case. The typical damage is from unauthorized people going under the bleachers, tripping on the row locks and bending them, causing additional problems. This also happens to some manufacturers’ interlocking guide rods. When you catch them with your foot and they pull out, the structural frames are no longer interlocked together and it creates a problem with guidance and structural support. Damaged Seats: Cracked, damaged, and loose seating can cause an unstable seating surface for your patrons and can cause a cut hazard with sharp edges and splinters. Baseballs can break the faces of Wood Planks/Riser Boards and the faces of Plastic Seat Modules. People stomping on the tops of seats can break holes in them also. When either one is broken, there are sharp edges that can injure your spectators. These items should be repaired. Loose hardware on seats can also cause someone to fall resulting in personal injury and liability. – Hussey MAXAM Owners & Maintenance Manual. Students and patrons climbing and/or sitting on the top tier of the bleachers while they are in the closed position is one of the main ways cantilever frame arms get damaged. Another common problem we have seen is when people are sitting on the upper tiers in the closed position, they tend to want to jump down to the lower levels. This not only can be very dangerous for the person doing the jumping, but very bad for your cantilever arms and your bleacher decks. It will also be costly to repair since misuse of the system is not covered under the manufacturer’s warranty. What does it impact? Cantilever frame arms are vital to the life of your bleachers. They attach to the main frame essentially holding up each bleacher deck which makes it easier to open and close your system. 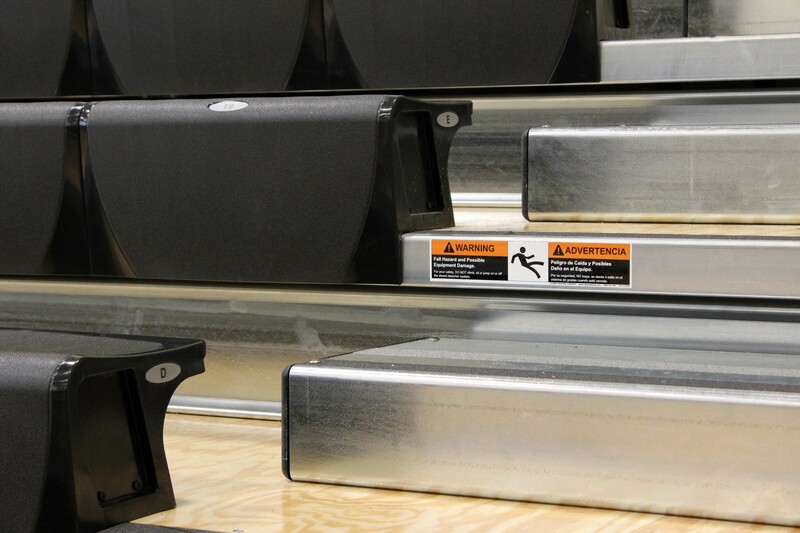 If they start to bend or drag, the bleacher decks will start to rest on top of one another causing unnecessary friction during operation and sometime stopping operation all together and causing a continuous flow of premature wear to spread through your seating system. What to do? If you don’t already have warning labels or signs in place stating the bleachers should not be occupied in the fully or partially closed position, you should add them. If you are in need of these warning labels, you can contact us and we would be happy to get you what you need! It’s best to be sure anyone using your system: Athletic Directors, Coaches, Maintenance, etc., is aware of these rules and guidelines because what may look like a cool place for students to sit could end up costing much more. If you need only a small section of seating, you can use your Flex-Rows if you have them, otherwise you should open the entire bank. You also have the option for a secondary locking system for partial seating. For example, with a 15-row bleacher, you can set a secondary locking system on the bleachers to open only 8 rows of seating and still be locked safely in the open position. When in this position, you can incorporate a top closure to cover the seating rows that are still in the closed position to prevent people from climbing, sitting, standing and storing things on telescopic bleachers while in the closed position. See how Botkins Local School District does this with their telescopic bleachers.